Evie, Betty and Jacquie. Went well, small (20) group. A llama was potentially donated. Betty donated 5 sets of chicks in our honor…..yay, Betty, thanks! See attached donation slip…the wording is per our working together on the Kiwanis talks and a take on the original quote, which we could not change since we were quoting the Kiwanis President. Evie spoke to them, a small group. 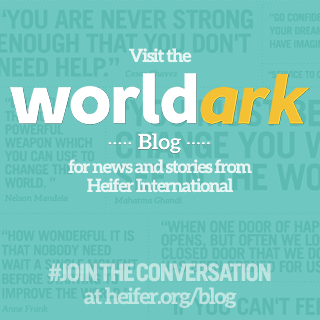 Peace tradition within Heifer via Dan West history. Good questions and enthusiastic respose. Kathy M couldn’t be present today. Linda DY, Linda L, Betty talked about their experiences and enjoyed tabling. We don’t sell animals there currently, but maybe we can find a way to sell with the $ separately coming to us. Jeannine Scott talked about Kathy M doing a training for the Peace Table which would include talking about the basics and how to best handle uncomfortable comments/questions from people. Apple Fair - Aug. 10 and 11. Need volunteers. That Sunday our Napa group can carpool. Hope and Evie will drive on Sunday and can carry people. Others offered to drive as well, Jessie, Linda L, Linda DY (?). Perhaps take 2 shifts, early and late with 2 cars. Sonoma group will cover entrance fees for all the volunteers through reimbursement. A parking fee may not be covered. Linda DY has contacted the churches for Alt. Gift Fairs this year. 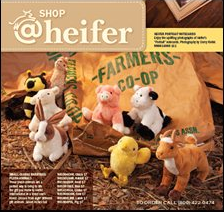 She passed around the magazine Animal Crackers which is part of the Heifer curriculum. See Linda’s notes under Future Presentations below. The Unitarian Universalist Fellowship of the North Bay has asked for a presentation for Aug 18, 9:30am, 45 min. Evie will talk to contact Margaret Craig re: what they want. AAUW, focus on women’s empowerment, middle of week in evening, at library. Start at 6 or 6:30pm, November. AAUW Program of the month. Nov 5, 1st choice, then Nov 12. Person who has done it before has retired. I told them we wanted to have a table. The mission committee will call to tell us when it is, if they have one. Liz Groelle is in charge of fair this year, a new person. I told her we wanted to have a table. She will let me know after the end of July when it is. *She wants us to send her a brochure or something. Contact about Sunday school closer to fall. Person in charge is ill.
No alternative fair this year. We can have a table between services on October 27 and read Beatrice the Goat during time with the child at the 9:30 am worship service. *Need a volunteer to read the book. Dave Whitmer sent an email about this. He also said we could show a Heifer DVD after the worship service. I left a message with Vicki Poli about Sunday school curriculum. Unitarian Emailed response from Jeannine, the Quakers are part of the UU Social Justice Committee. Margaret Craig (258-0341) from the UU Social Justice Committee called. She said they wanted us to do a presentation/show video on August 18 at 9:30 am at the Boys and Girls Club to their Third Sunday Social Justice meeting. (before the service at 11:00 am) We could also have a table set up at this time. They wanted to invite more people to come and asked if Betty could help with publicity. They have chosen Heifer International to be the receiver of the Share the Plate on the 4th Sunday in March, the 23rd at the 11am service. We could have a table at that time as well. Jeanine is our contact for that activity. Unity and Center for Spiritual Living – Left a message. *AAUW would like us to do a Program in November focusing on Women’s Empowerment/ Gender Equity/ Women’s Literacy Program. It could be at the Napa County library November 5, 12 or 13th in the evening, 6 or 6:30 pm. What would be the best day - I need to reserve it ASAP. We could invite the Soroptimists and the Napa Women’s Club etc. Jacquie and Evie – showed short videos, talked about tech choices. Speakers worked well in that size room. 0 Response to "Minutes - July 13,2013 - Napa"